The process of purchasing or upgrading an asphalt plant requires thorough research, thought and consideration, but will be worth it, as most owners see a return on investment within a few years. Asphalt costs money. You know that. If you take out the price of labor lost while traveling to get hot mix and leaving the crew waiting, and you eliminate the expense of operating those trucks, how much would that drop the price of your asphalt? The answer is different for every operation. In some cases, it drops the price enough to easily justify purchasing your own asphalt plant to have on site. But how do you know if it’s a good decision for your business? In this blog series, we’re walking you through the elements to consider. In this installment, we’ll examine the impact of your location on ROI. Rules and regulations for asphalt plants vary greatly from one area to the next. Permitting rules and fees, for example, are different for each state. Where one state may list exact permit fees for various activities, another will calculate fees based on asphalt production quantity, diesel generator kilowatt hours, and gallons of diesel fuel burned. Keep in mind, too, that acquiring a permit can take six to 12 months, so plan ahead and start the process early. Environmental issues may come into play when applying for a permit. On a positive note, asphalt plants are no longer a serious threat to the environment. 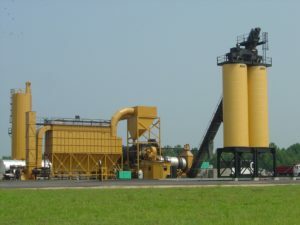 In fact, the Environmental Protection Agency announced in 2002 that asphalt plants were no longer on its list of industries considered to be major sources of hazardous air pollution. Modern plants burn much cleaner than older plants. Also, asphalt recycling has increased since the 1970s, with asphalt now being the most recycled material in America. But even with these environmental improvements, be aware that in some areas it may still be difficult to get a permit for certain plant designs. Look into any transport restrictions that may apply to your area. As a new producer, you’ll need to establish trucking provisions to transport material from the plant to the jobsite if you haven’t already established that. One final factor that will impact the location of your plant is the type of plant you will eventually purchase. Plants are either portable or stationary. A stationary plant may be the best choice in some situations, but a portable plant will offer flexibility in terms of location and permitting requirements. In areas where jobs are considerable distances apart, a portable plant would be the best choice. Some markets experience minimal growth and have a small population density, while others may see workloads shift from one area to another due to seasonal factors. A portable plant would be the most sensible in these types of areas, as well. Also, it’s typically easier to get a permit for a portable plant’s location than for a stationary unit. Portable permits will be granted for one main location, and then, depending upon the state, subsequent temporary permits for operating locations will be easier to obtain or may not even be required. To avoid any surprises down the road, explore any restrictions and permitting fees early in the process. Taking the time to research location and related factors will also save time and help you choose the plant best suited for your area or areas of operation. Do you have questions about sizing an asphalt plant for your operation? Contact us!